The flags will be processed with dignity and respect while honoring a fallen veteran at the same time. At the time of death of a veteran, who will be cremated, permission will be sought to use a retired U.S. flag to drape the cremation container. Upon receipt of the cremated remains of their veteran, the family will receive a certificate stating the last deed of service for that flag, which was to drape their veteran during the cremation process. The collection receptacle is for anyone who has a worn flag, no longer worthy of service, who wants to properly dispose of the flag in a dignified manner. 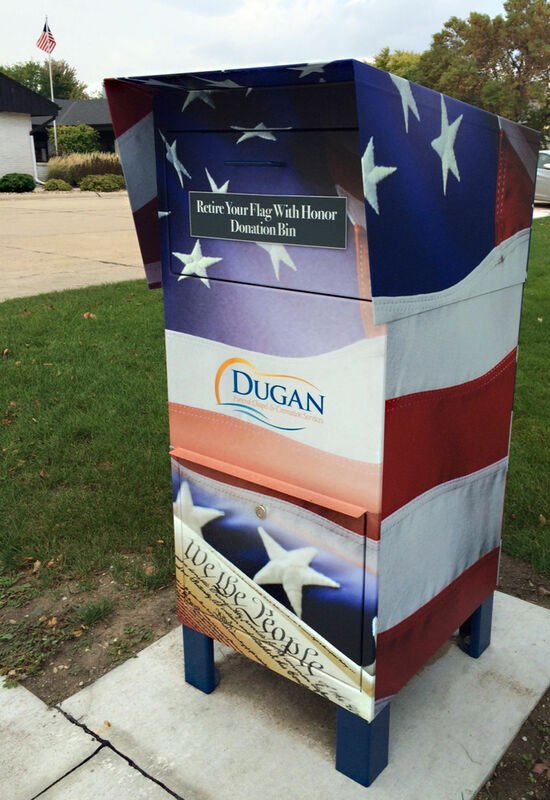 The box, located on the south drive of Dugan Funeral Chapel allows citizens to retire their flags 24/7. The flags will be processed with respect, in accordance with flag protocol, and will honor a fallen veteran at the same time. In the short time the box has been in place, more than 700 flags have been received. Please contact Dugan Funeral Chapel at 721-2880 for more details.